Ninety-five years ago today, Europe carved up the Ottoman empire. That treaty barely lasted a year, but we're feeling its aftershocks today. Ninety-five years ago today, European diplomats gathered at a porcelain factory in the Paris suburb of Sèvres and signed a treaty to remake the Middle East from the ashes of the Ottoman empire. The plan collapsed so quickly we barely remember it anymore, but the short-lived Treaty of Sèvres, no less than the endlessly discussed Sykes-Picot agreement, had consequences that can still be seen today. We might do well to consider a few of them as the anniversary of this forgotten treaty quietly passes by. In 1915, as British troops prepared to march on Istanbul by way of the Gallipoli peninsula, the government in London printed silk handkerchiefs heralding the end of the Ottoman empire. It was a bit premature (the battle of Gallipoli turned out to be one of the Ottomans’ few World War I victories) but by 1920 Britain’s confidence seemed justified: With allied troops occupying the Ottoman capital, representatives from the war’s victorious powers signed a treaty with the defeated Ottoman government that divided the empire’s lands into European spheres of influence. 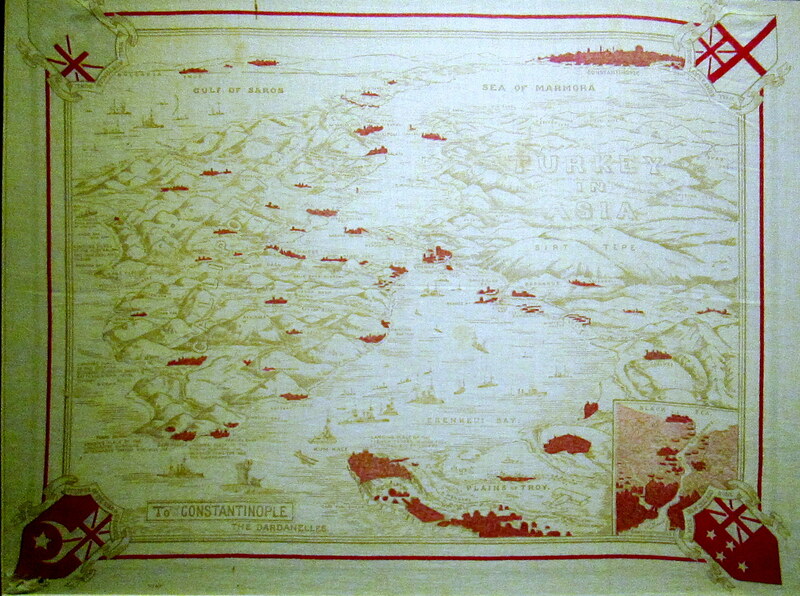 Sèvres internationalized Istanbul and the Bosphorus, while giving pieces of Anatolian territory to the Greeks, Kurds, Armenians, French, British, and Italians. Seeing how and why the first European plan for dividing up the Middle East failed, we can better understand the region’s present-day borders, as well as the contradictions of contemporary Kurdish nationalism and the political challenges facing modern Turkey. Within a year of signing the Treaty of Sèvres, European powers began to suspect they had bitten off more than they could chew. Determined to resist foreign occupation, Ottoman officers like Mustafa Kemal Ataturk reorganized the remnants of the Ottoman army and, after several years of desperate fighting, drove out the foreign armies seeking to enforce the treaty’s terms. The result was Turkey as we recognize it today, whose new borders were officially established in the 1923 Treaty of Lausanne. Sèvres has been largely forgotten in the West, but it has a potent legacy in Turkey, where it has helped fuel a form of nationalist paranoia some scholars have called the “Sèvres syndrome.” Sèvres certainly plays a role in Turkey’s sensitivity over Kurdish separatism, as well as the belief that the Armenian genocide — widely used by European diplomats to justify their plans for Anatolia in 1920 — was always an anti-Turkish conspiracy rather than a matter of historical truth. Moreover, Turkey’s foundational struggle with colonial occupation left its mark in a persistent form of anti-imperial nationalism, directed first against Britain, during the Cold War against Russia, and now, quite frequently, against the United States. But the legacy of Sèvres extends well beyond Turkey, which is precisely why we should include this treaty alongside Sykes-Picot in our history of the Middle East. It will help us challenge the widespread notion that the region’s problems all began with Europeans drawing borders on a blank map. There’s no doubt that Europeans were happy to create borders that conformed to their own interests whenever they could get away with it. But the failure of Sèvres proves that that sometimes they couldn’t. When European statesmen tried to redraw the map of Anatolia, their efforts were forcefully defeated. In the Middle East, by contrast, Europeans succeeded in imposing borders because they had the military power to prevail over the people resisting them. Had the Syrian nationalist Yusuf al-‘Azma, another mustachioed Ottoman army officer, replicated Ataturk’s military success and defeated the French at the Battle of Maysalun, European plans for the Levant would have gone the way of Sèvres. Would different borders have made the Middle East more stable, or perhaps less prone to sectarian violence? Not necessarily. But looking at history through the lens of the Sèvres treaty suggests a deeper point about the cause-and-effect relationship between European-drawn borders and Middle Eastern instability: the regions that ended up with borders imposed by Europe tended to be those already too weak or disorganized to successfully resist colonial occupation. Turkey didn’t become wealthier and more democratic than Syria or Iraq because it had the good fortune to get the right borders. Rather, the factors that enabled Turkey to defy European plans and draw its own borders — including an army and economic infrastructure inherited from the Ottoman empire — were some of the same ones that enabled Turkey to build a strong, centralized, European-style nation-state. Of course, plenty of Kurdish nationalists might claim that Turkey’s borders actually are wrong. Indeed, some cite Kurdish statelessness as a fatal flaw in the region’s post-Ottoman borders. But when European imperialists tried to create a Kurdish state at Sèvres, many Kurds fought alongside Ataturk to upend the treaty. It’s a reminder that political loyalties can and do transcend national identities in ways we would do well to realize today. The Kurdish state envisioned in the Sèvres Treaty would, crucially, have been under British control. While this appealed to some Kurdish nationalists, others found this form of British-dominated “independence” problematic. So they joined up to fight with the Turkish national movement. Particularly among religious Kurds, continued Turkish or Ottoman rule seemed preferable to Christian colonization. Other Kurds, for more practical reasons, worried that once in charge the British would inevitably support recently dispossessed Armenians seeking to return to the region. Some subsequently regretted their decision when it became clear the state they had fought to create would be significantly more Turkish — and less religious — than anticipated. But others, under varying degrees of duress, chose instead to accept the identity the new state offered them. Many Turkish nationalists remain frightened by the way their state was destroyed by Sèvres, while many Kurdish nationalists still imagine the state they might have achieved. At the same time, today’s Turkish government extolls the virtues of Ottoman tolerance and multiculturalism, while Kurdish separatist leader Abdullah Ocalan, apparently after reading the sociologist Benedict Anderson in prison, claims to have discovered that all nations are merely social constructs. The governing Justice and Development Party (AKP) and the pro-Kurdish HDP spent much of the last decade competing to convince Kurdish voters that a vote for their party was a vote for peace — competing, that is, over which party was capable of resolving Turkey’s long-simmering conflict by creating a more stable and inclusive state. In short, as many Americans still debate the “artificial” nature of European-made states in the Middle East, Turkey is fitfully transcending a century-long obsession with proving how “real” it is. Needless to say, the renewed violence Turkey has seen in the past several weeks threatens these fragile elements of a post-national consensus. With the AKP calling for the arrest of Kurdish political leaders and Kurdish guerrillas shooting police officers, nationalists on both sides are falling back into familiar, irreconcilable positions. For 95 years, Turkey reaped the political and economic benefits of its victory over the Treaty of Sèvres. But building on this success now requires forging a more flexible political model, one that helps render battles over borders and national identity irrelevant.